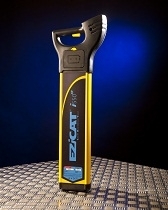 Cable Detections EZiCAT xf-Series locators provide operators with additional 512Hz and 640Hz tracing modes, enabling operators to trace buried utilities over greater distances or to easily detect sewer – camera inspection systems. Additional features include Mode Lock – the locator starts in the last mode of operation and Current Measurement, used to trace and identify services when using the EZiTEX signal transmitter and Extended sonde depth - depth readings to 10m. Current Measurement - Displays the amount of current flowing through a service helping to trace and verify the utility the EZiTEX is connected too. This enables improved tracing and identification of an individual service in congested site situations. Improved Sonde Depth Estimation- An improved depth estimation up to 9.9mtres for a greater tracing capability when using the EZiCAT i550 xf or i650 xf. Enabling the depth of deeper sewer lines to be estimated benefitting camera and sonde users. Hazard Zone – Buried utilities close to the surface pose a safety risk to site works. The Hazard Zone function provides an additional warning of the close proximity of buried services, alerting users to the immediate danger. Signal Strength Indicator - SSI enables the user to trace an individual service amongst a multiple of services. The numeric display shows the highest reading over the service, which has the EZiTEX Signal Transmitter connected too. This ensures the user can follow the service without straying onto another. The SSI mode can also be used to trace the Dual Frequency Sonde with ease.